Chrichton's World: Review Undeclared War a.k.a. Sheng zhan feng yun (1990): Decent and nothing more! 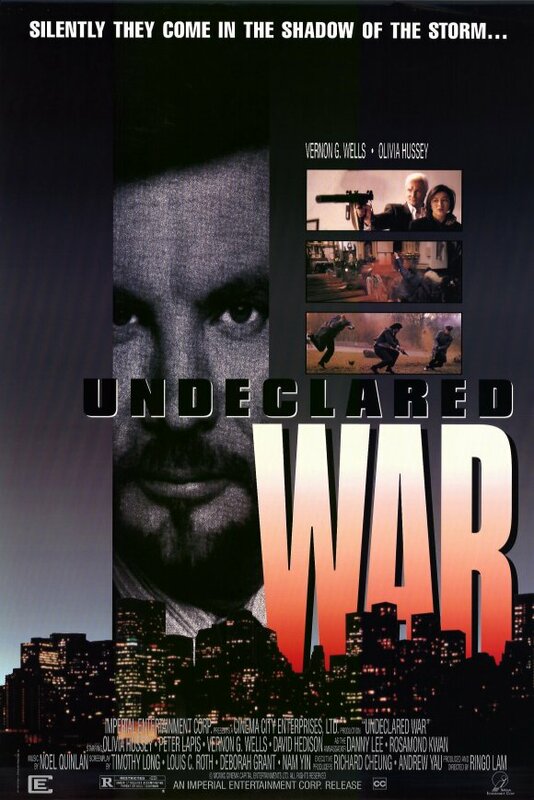 Review Undeclared War a.k.a. Sheng zhan feng yun (1990): Decent and nothing more! In my never ending search for bullet ballet / heroic bloodshed titles, Undeclared War, gets mentioned quite often. But somehow it's hard to find proper reviews for it. It could be the fact that at the time the title wasn't that successful but also that it's hard to get a DVD copy. Well, I managed to get a hold of one and I finally was able to watch it. So here are my thoughts on it. It definitely is not a title that is going to blow you away. But for what it was offering it's not that bad. Director Ringo Lam thought it necessary to go international probably to make it more appealing for a larger audience. In this he succeeded. It's one of those dime in a dozen titles most people would watch when it's on television and then forget about it. And in case you couldn't tell I am being sarcastic. The normal audience back then didn't appreciate Hong Kong titles as they should have. This was only reserved for the happy few (like me) who couldn't get enough of them. The title would have been more popular if he had increased the bloodshed for example. And in this case it would have made sense since the characters do keep referring to an undeclared war. How can this be the case if there are only a few shoot-outs and explosions? What about these shoot-outs? They are kinetic and stylish enough but there are only two or three proper ones. And they don't last that long. But when they appear it is thrilling and exciting because the terrorists under leadership of Hannibal (Vernon Wells) are very ruthless. Too bad though that the duration of those action sequences are relatively short. A real shame because the buddy cop elements are also very minimalistic. The dynamics between Danny Lee and Peter Liapis were decent and they would have been able to convince the viewer of their new found friendship. Had they been given the time and events to do something worthwhile with it. The characters barely talk to each other. I mean it's all reactionary. There isn't a single scene where they actually sit down and converse. In a buddy cop film you have to have at least one of those scenes. Speaking of Vernon Wells. He is severely underused. As is Olivia Hussey. Same goes for Danny Lee. Now I think about it. There is no real lead. I mean even if you would classify Peter Liapis as one he still acts and is featured as a side character. It really would have helped the immersion if we had followed the story from someone's perspective instead of just viewing events with very little involvement at all. Besides this way we would get some idea what the characters are about. I am not familiar with Peter Liapis but he is quite competent as an actor. He certainly has a charm to it. But like I said, nothing is done with these characters outside the main plot. Overall Undeclared War is a decent title but it's not offering anything fresh or creative. Nor is it providing the heroic bloodshed some of you were hoping for.